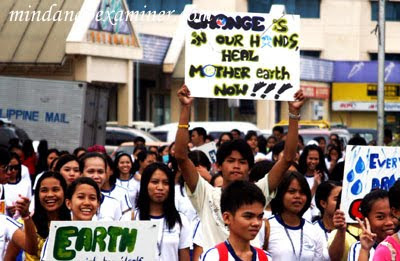 DAVAO CITY, Philippines (Mindanao Examiner / June 28, 2010) – Hundreds of students marched on Monday in the southern Filipino city of Davao and joined mounting calls from environmentalists and various groups for more environment protection, particularly against mining and logging in the country. The march, participated by some 500 students from different Catholic schools, coincided with the celebration of the Environment Month. According to the Department of Environment and Natural Resources, the United Nations Environment Program reported that a total of 17,291 species known to be threatened with extinction and that many species are still disappearing before they are even discovered. MAYNILA (Hunyo 28, 2010) - Apat na milyong Pilipino - sa pinakamababa - na idinagdag sa hanay ng mga mahihirap at wala na umanong mas sisimple pang pagsusuma sa iiwang legasiya ng papaalis na rehimeng Gloria Arroyo, ayon sa pahayag ng grupong Kalipunan ng Damayang Mahihirap (Kadamay). Kaya't ang anila'y una at pinakamahalagang tagubilin na dapat pakatandaan ni President-elect Noynoy Aquino, na sa makalawa ay manunumpa na sa tungkulin, ay huwag sana itong magiging "bagong GMA." Isang 'lapida para sa rehimeng Arroyo' ang hinatid ng grupo sa Mendiola sa isang malakihang pagkilos ngayon, upang anila'y "itatak sa pang-habampanahon" ang pinal na hatol ng maralitang-lungsod sa kinamumuhiang panguluhan, matapos dumaan sa tirahan ni Aquino sa Times St. upang ihatid naman ang kanilang mensahe dito. Ayon lamang sa datos ng gubyerno (at gamit ang napakababang poverty line), 2.1 milyong Pilipino ang nadagdag sa bilang ng mga mahihirap mula 2000 hanggang 2006. Sinundan naman ng ito ng di-bababa sa dalawa pang milyon sa huling apat na taon, ayon sa pag-aaral na kinomisyon ng United Nations Development Programme (UNDP). Ang itinurong dahilan ng naturang pag-aaral, na inilabas lamang nitong nakaraang linggo: ang pagtaas ng presyo ng pagkain mula 2007 hanggang 2008, ang global financial and economic crisis ng 2008-09, at ang sunod-sunod na hagupit ng mga bagyong Ondoy, Pepeng at Santi. Subalit sa kabila ng krisis, ang karagdagang 2 milyong mahihirap sa huling apat na taon ay hindi na umano katanggap-tanggap ('simply unacceptable'), ayon na rin kay UNDP country director for the Philippines Renaud Meyer. Itinala ng gubyernong Arroyo ang pinakamahabang panahon ng sustained high unemployment sa kasaysayan ng bansa. Sa halip na masawata ang disempleyo, gaya ng ipinangako ni Arroyo sa kanyang SONA noong 2001, tumaas pa ng 621,000 ang bilang ng mga walang trabaho (unemployed) at 1.9 M naman sa mga kulang sa trabaho (underemployed), mula 2001-2009. Malaki rin ang pananagutan dito ni Vice President Noli de Castro, ayon sa grupo, bunga ng papel nito sa malawakang demolisyon at pagsusulong ng anila'y 'negosyong pabahay'. Kaya't payo ng grupo sa bagong Pangulo, pinakamainam na simula ang pagtitiyak lamang na hindi ito susunod sa yapak ni Arroyo. "Tignan lamang ni Noynoy ang 'road map' na tinahak ni GMA, at pumunta siya sa kabilang direksyon," ani Carlito Badion, pangalawang pangulo ng Kadamay,"kung ayaw niyang magkaroon ng lapidang kagaya nito pag nagtapos na ang kanyang termino." Tampok din sa ginanap na pagkilos ang usapin ng proyektong Quezon City-Central Business District (QC-CBD), isa sa mga proyektong isinulong ng administrasyong Arroyo na ipinababasura ng grupo kay Aquino, dahilan sa malawakang demolisyon na idudulot nito sa may 25,000 pamilyang maralita. 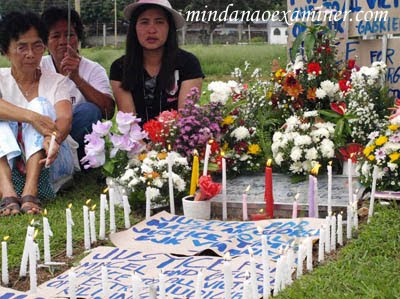 MANILA, Philippines (Mindanao Examiner / June 25, 2010) – The United States on Friday condemned the murder of a key witness in last year’s brutal slaying of 57 people in the southern Philippines. Assassin had shot Suwaib Upham last week in the town of Parang in Maguindanao province whose governor Andal Ampatuan Sr. and his sons were linked by authorities to the November 23 killings. 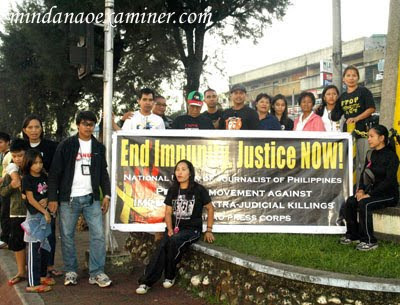 Among those killed were at least 32 journalists accompanying the political caravan of Esmael Mangudadatu, a political foe of the Ampatuan clan. His wife and sisters and supporters were also murdered. Upham was one of those accused in the grisly slayings, but he turned against the powerful Ampatuan clan for fear that he would also be killed after some of those involved were murdered one after the other. 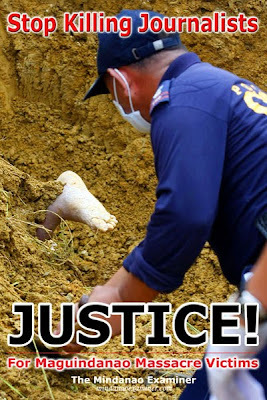 “I deplore the murder of Mr. Suwaib Upham, who bravely came forward to testify about the tragic Maguindanao massacre. I urge the Philippine authorities to conduct a swift investigation into his death and bring those responsible to justice,” said US Ambassador Harry Thomas, Jr.
No individual or group claimed responsibility for Upham’s murder, but Thomas urged Manila to investigate the killing. “This murder adds additional urgency to the need for swift investigation and prosecution of those responsible for the brutal massacre of 57 people in Maguindanao in November 2009. Too many families still wait justice, and now the Upham family joins them,” Thomas said. 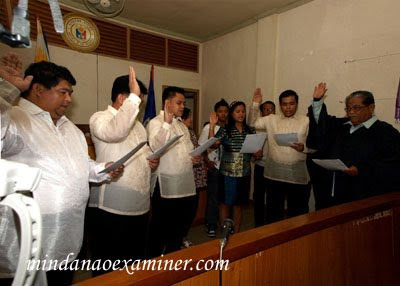 Nearly 200 people had been charged in the murders, including Datu Unsay town mayor Andal Ampatuan Jr., one of the prime suspects; and his elder brother, Zaldy Ampatuan, the governor of the Muslim autonomous region, among other clan members. About one-third of those accused are now locked- up in jail, including the clan’s patriarch and his sons, but they still enjoy special treatment in prisons because of their immense wealth and influence. 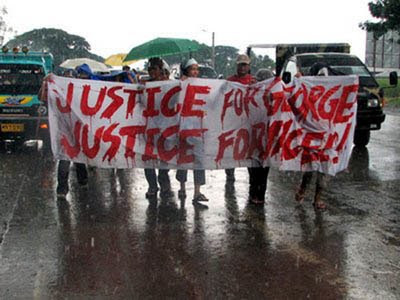 MANILA, Philippines (Agence France-Presse) – A key witness in the trial of a powerful Muslim clan accused of orchestrating the worst political massacre in the Philippines has been shot dead, a prosecutor said Thursday. The witness, Suwaib Upham, claimed to have taken part in the November killings of 57 people in a crime allegedly planned by his former employers, the Ampatuan clan. "He was supposed to be one of our strongest witnesses," prosecutor Harry Roque told Agence France-Presse. "He saw, and participated in, the killings and could have directly named in court those involved." Roque warned that Upham's killing, which he was told occurred last week in the southern province of Maguindanao, could potentially weaken the case against the Ampatuan family. US-based Human Rights Watch also said the killing raised doubts about the government's resolve in seeing justice done in the case. "Massacre witnesses are dying while the government sits on its hands," the group's Asia director Elaine Pearson said in a statement. "This sends the worst possible message to other witnesses thinking of coming forward." 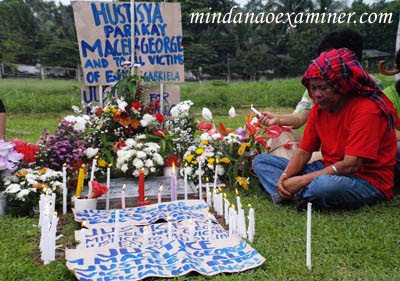 His death comes two months after an uncle of another witness was also shot and killed, in what authorities said was part of a plan to intimidate those speaking out against the Ampatuan clan. 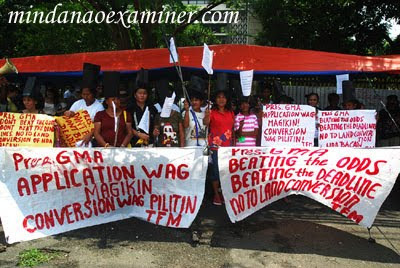 The clan had ruled Maguindanao with brutal efficiency for a decade prior to the massacre. They also enjoyed political ties with outgoing President Gloria Arroyo, who used the family's huge private army as a force against separatist rebels. 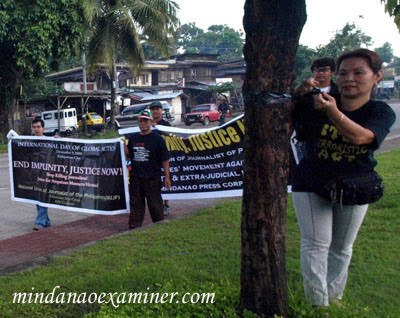 NEGROS OCCIDENTAL, Philippines - The peasant federation Task Force Mapalad has slammed the family of President Gloria Arroyo for its last-minute move to convert the family-owned Hacienda Bacan from agricultural to industrial use in Negros Occidental province. It said the 157-hectare sugarcane haciendaB in the village of Guintubhan in Isabela topwn, placed under coverage of the Comprehensive Agrarian Reform Program in 2001, was previously promised by Arroyo for distribution to 67 farmer-beneficiaries. 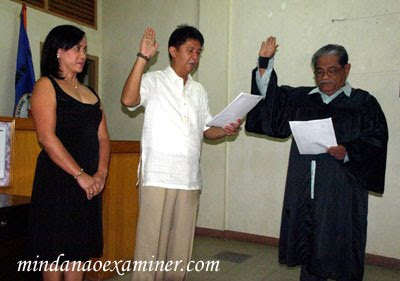 TFM president Jose Rodito Angeles said a report Wednesday by Vera Files that Ruy Rondain, lawyer of First Gentleman Jose Miguel Arroyo, filed an application for conversion of Hacienda Bacan last June 15 before the Department of Agrarian Reform. “The filing of the application is dubious and devious. 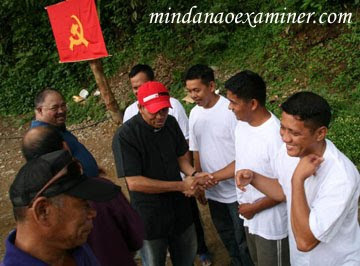 Hacienda Bacan is already government property since the Land Bank had already issued payment for it two years ago in the amount of P42.3 million,” Angeles said in a statement sent to the Mindanao Examiner. 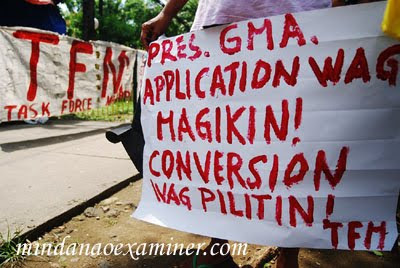 Angeles said that under the agrarian law, lands under CARP coverage cannot be subject to conversion. 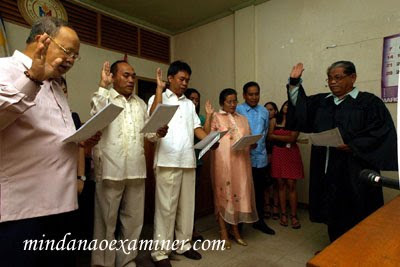 He said DAR had twice ordered the register of deeds of Negros Occidental to issue a new title for the hacienda in favor of the government but the ROD had not done so up to now, reportedly due to pressure from Arroyo. “We have also conducted protest actions to compel the ROD and even the Land Registration Authority in Quezon City to register a new title for Bacan so that DAR could already issue the CLOA (certificate of landownership award) of the farmer-beneficiaries, but we have been ignored,” Angeles said. 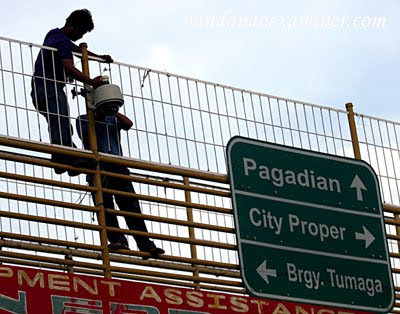 BASILAN, Philippines (Mindanao Examiner / June 23, 2010) – Four people were killed and six others injured when gunmen opened fire on a public transport on Wednesday in the restive province of Basilan, police told the Mindanao Examiner. Police said military forces were sent to track down more than two dozen hooded gunmen who were behind the ambush in Maluso town. “We still don’t know who were behind the attack, but military forces were sent to pursue the ambushers,” said Senior Superintendent Antonio Mendoza, the provincial police chief. He said the gunmen fled after the ambush and no group claimed responsibility for the attack. The town, he said, is a known lair of Abu Sayyaf and Moro Islamic Liberation Front rebels blamed for past attacks on civilian and military targets. “Most of those killed and wounded are civilians,” Mendoza said. Just early this month, Abu Sayyaf militants killed three men they kidnapped in Basilan’s Sumisip town after their families failed to pay P3 million ransoms. The trio - Claudio Mananita, Rolando Francisco and Dariel Quintella – were kidnapped on May 27 by Abu Sayyaf gunmen headed by Puruji Indama. Their bodies were discovered by civilians on June 5 in Sukaten village. Indama’s group was also behind many kidnappings in Zamboanga City and Basilan last year and tagged as behind the series of attacks on government troops in the province. Negosasyon sa paglaya ng dinukot na anak ng Comelec brass, nagsimula na! 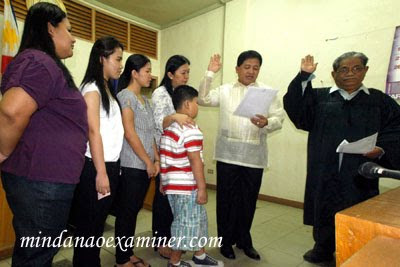 ILIGAN CITY (Mindanao Examiner / June 22, 2010) – Isa umanong negosasyon ang nagaganap upang mapalaya sa lalong madaling panahon ang dinukot na anak ni Commission on Elections Commissioner Elias Yusoph sa Lanao del Sur. Hindi naman makunan ng detalye si Yusoph o ang Crisis Management Committee ukol sa paguusap, subalit kinumpirma ng pulisya na may negosasyon na nga sa paglaya ni Nuraldin Yusoph, 22. 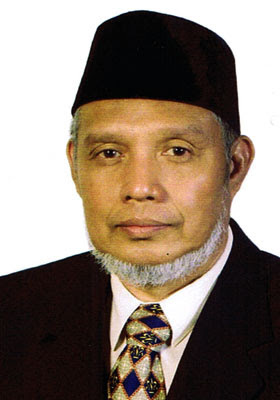 Si Nuraldin ay dinukot ng mga armado kalalakihan kamakalawa sa mosque sa Marawi City at agad na tinawagan ng mga ito ang ama ng biktima upang sabihing nasa kanila ang anak. Hiling ng mga kidnappers ay ibasura ni Yusoph ang resulta ng nakaraang halalan sa apat na bayan sa lalawigan. Kinumpirma naman ito ng pulisya at sinabi ni Senior Superintendent Bienvenido Latag, ang hepe ng pulisya sa Muslim autonomous region, na ang Crisis Management Committee sa pangunguna ng mga opisyal ng Lanao del Sur ang siyang inatasang lumutas sa pagdukot. Sinabi pa ni Latag na hinihingi nga ng mga kidnappers na ibasura ang resulta ng eleksyon sa bayan ng Malabang, Taraka, Pikong at Masiu kapalit ng paglaya ni Nuraldin. May hinala naman ang pulisya na kamag-anakan rin ni Yusoph ang nasa likod ng pagdukot sa akalang may kapangyarihan ito na i-annul ang resulta ng halalan sa nasabing mga bayan. Tikom rin ang bibig ni Yusoph ukol sa kaso, ngunit may komunikasyon umano ito sa mga kidnappers. Isa lamang si Nuraldin sa 10 anak ni Yusop. Kaguluhan sa Cotabato, patuloy pa rin! Nakaabang ang mga motorboat na ito sa pasaherong galing sa palengke sa Cotabato City sa Mindanao. 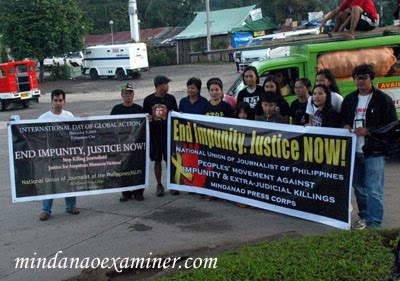 (Kuha ng Mindanao Examiner). 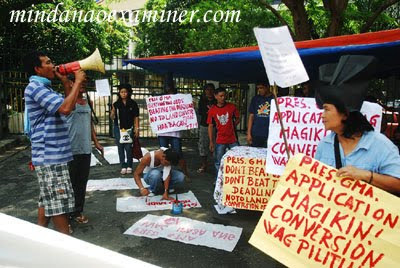 COTABATO CITY (Mindanao Examiner / June 22, 2010) – Mistulang Afghanistan na ang lungsod ng Cotabato sa Mindanao dahil sa walang humpay na patayan at pambobomba doon at tila inutil ang pulisya at militar na mapigil ang krimen at terorismo. Ito’y matapos na isang bomba na naman ang sumabog sa isang sangay Mercury Drugstore nuong Lunes, ngunit masuwerteng walang nasawi sa atake. Pinaniniwalaang konektado sa extortion ang nasabing pagsabog. Hiling naman ng mga negosyante doon na paigtingin ang intelligence at patrulya ng mga sundalo at parak upang mapigilan ang kaguluhan. Sinisisi naman ng iba ang ilang mga opisyal ng Cotabato dahil sa hindi nito maisaayos ang lungsod. 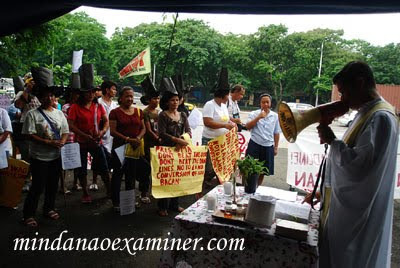 Minsan ng binansagan ng US Embassy na “doormat to terrorism” ang lungsod ng Cotabato. Mismong si US Ambassador Francis Ricciardone ang nagbansag nito sa Cotabato ilang taon na ang nakaraan dahil sa matinding kaguluhan. 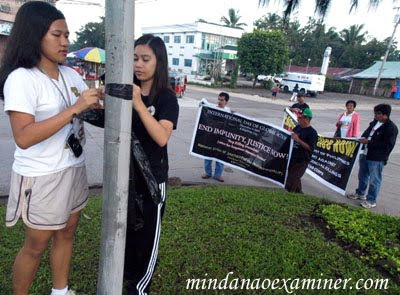 DAVAO CITY, Philippines (Mindanao Examiner / June 20, 2010) – An unidentified gunman shot dead a Filipino journalist in an attack in the southern Philippines, police and media reports said. 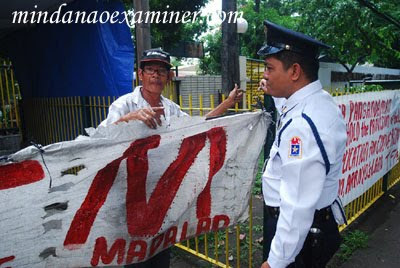 Police said Nestor Bedolido, who wrote for the newspaper “Kastigador” was shot on Saturday night in Digos City. He was the third journalist killed in recent weeks. The motive of the attack was unknown and police said it launched an investigation to the murder of Bedolido. 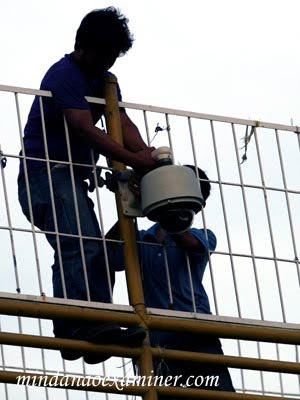 Last week, broadcasters Jovelito Agustin and Desiderio Camangyan were killed in separate attacks. Agustin was fatally shot in Laoag City in northern Philippines while Camangyan had beekn killed in Davao Oriental province. Reporters Without Borders on Thursday urged President Gloria Arroyo and President-elect Benigno Aquino 3rd to react firmly to the murders of two provincial radio presenters in the past two days. Two weeks before Aquino’s swearing-in, there are clearly people in positions of influence who think they can still hire hit-men to silence critical journalists with impunity. Desidario Camangyan, 52, the host of a discussion program on Sunshine FM, was gunned down while on the stage of a singing contest in Manay, in the southeastern province of Davao Oriental, on the evening of 14 June. Police office Ariel Nueva said Camangyan was sitting on the stage when a gunman fired a single shot to his head and then left on foot. A police spokesman told Reporters Without Borders that a team had been formed to investigate the case and that they were looking closely at the possibility of a link to Camangyan’s journalistic work. Colleagues at Sunshine FM, which is part of the Kalayaan Broadcasting Network, told journalists’ organizations that Camangyan was often critical in his program of local politicians and those responsible for deforestation. He leaves a widow and a six-year-old son. 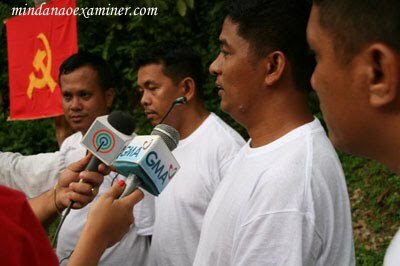 Joselito Agustin of dzJC Aksyon Radyo, a local station, was riding a motorcycle with his nephew in Laoag City, in the northern province of Ilocos Norte when he was shot four times by two men on another motorcycle. His nephew was wounded. Aged 37, Agustin died last night in hospital. A colleague, Nick Malasig, said Agustin had receiving threatening SMS messages. “Joselito suspected that a local politician had him in his sights, a politician he had accused of corruption in his program.” Sterling Blanco, the police officer in charge of the investigation, said shots were also fired at Agustin’s home last month. 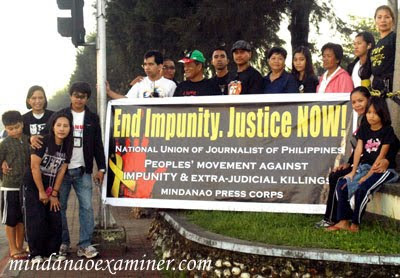 A total of four journalists have been killed in the Philippines since the start of the month. 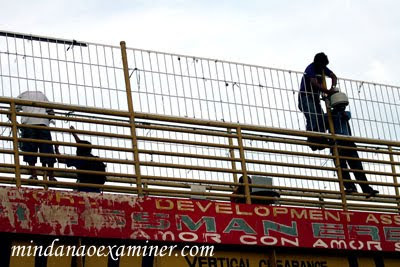 ZAMBOANGA CITY, Philippines (Mindanao Examiner / June 17, 2010) – Gunmen seized a local trader Thursday while traveling at sea in Zamboanga City in the southern Philippines where security forces are pursuing kidnappers a Filipino-Swiss. Police said the victim, Vicente Barrios, was abducted by gunmen after he was intercepted at sea. 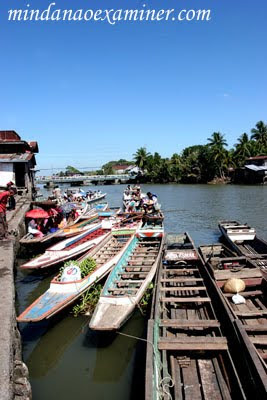 Barrios was with several companions aboard a motorboat when gunmen on a speedboat intercepted them and seized the trader. “We still don’t know the motive of this incident. We have dispatched forces to locate the victim,” Chief Inspector Ricardo Garcia told reporters. The abduction occurred a day after police commandos, backed by soldiers killed one of three gunmen tagged as behind the April 4 kidnapping of Charlie Reith, 72, who was rescued early Wednesday in the coastal village of Labuan. Police said the slain gunman, Habir Ibno Kais, was with two others who managed to escape, but security forces were pursuing them. Senior Superintendent Edwin de Ocampo, the city police chief, said security forces tracked down the trio in the neighboring village of San Ramon and clashed with them. “It was part of our operation and Kais was killed in the firefight. 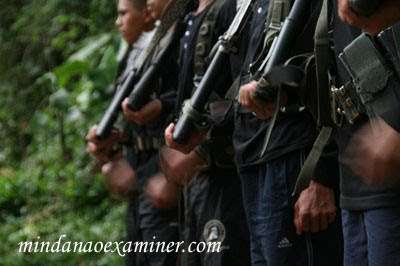 There is pursuit operation going on to track down the other kidnappers of Reith,” he said.